Foliovision is in the web design business. Often enough we have to shoot a full length screenshot of a website. There are three utilities we normally use in order. Layers. More for fancy documentation, the full page webpage screenshot functionality is great and works with Safari, Firefox and some other browsers (not Chromium though). 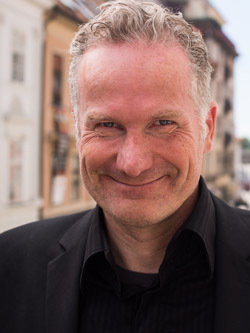 Netfixer. From ShinyFrog, neglected, badly named but quite brilliant software. Paparazzi. First on the scene, disappeared for a long time without regular maintenance. Back with a glistening new icon and sharing cookies and webkit with Safari. Today, I had a special situation. I wanted to screenshot our full monthly hours in January for our coordinator to review. The page turns out to be 169570 pixels long. That's over 29 MB of PNG! We have over 2300 hours/month in our timesheets, many broken down into as many as 10 entries. 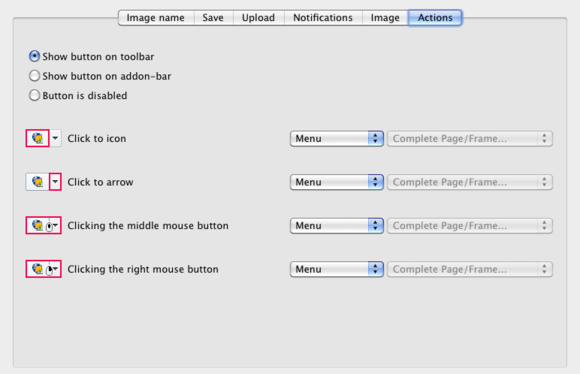 How did the OS X long webpage screenshot utilities fare under extreme stress? Layers crashed a couple of times but finally did get the shot in composite mode (not layer mode) from Safari. Unfortunately Layers includes a hard limit at 150,000 so I didn't have my full document. Got cut off on the letter V. Almost but not quite. 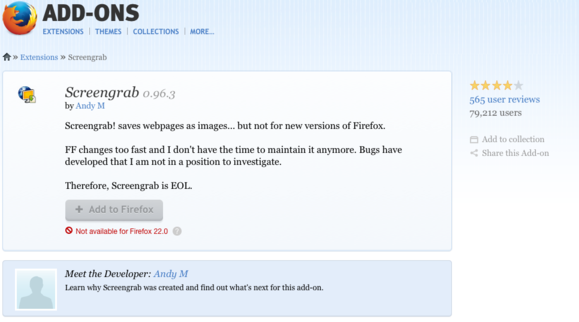 We decided to try Screengrab for Firefox as I'd read good things about it. 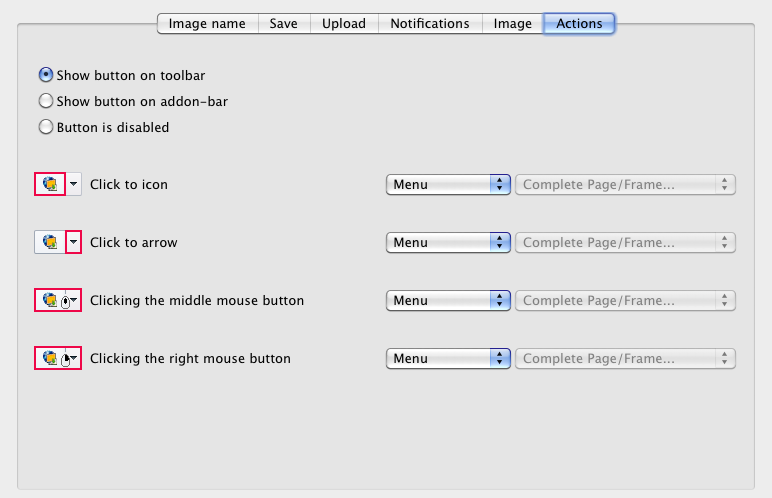 Screengrab was quick and easy to install and has a full set of preferences. Screengrab could only manage 32760 pixels so we were cut off around H. Hopeless. 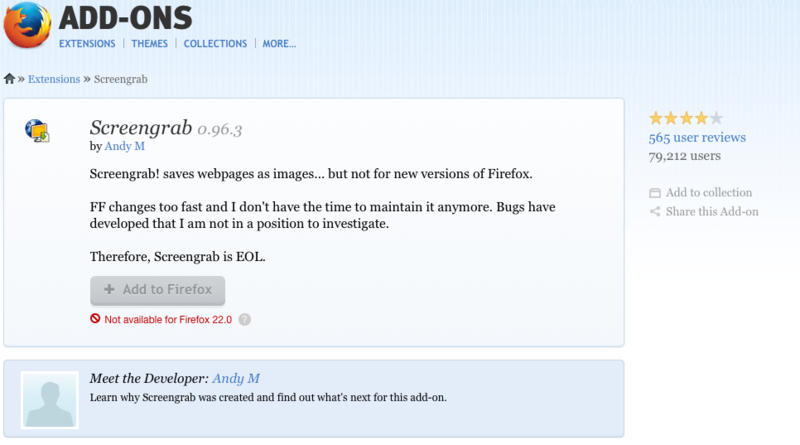 Curiously the original developer of Screengrab (Andy M) dropped the project as he was tired of playing update whack-a-mole with Mozilla with Firefox now above thirty versions. I must say I feel the same way about WordPress these days. Next up to the plate was Paparazzi. We finally updated to the current one with the shiny new icon. Paparazzi shares cookies with Safari so we were able to screenshot our password protected page with no difficulty. Curiously Paparazzi got the whole page at 169,570 pixels. I don't have a longer page to test so I'm not sure where Paparazzi would collapse. Good show. With one good capture in hand, I decided to test Netfixer too. I wasn't sure if Netfixer can screenshot a password protected page. 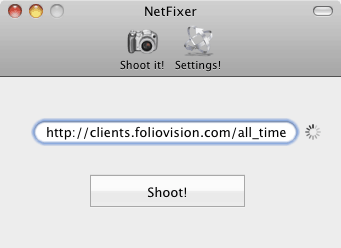 It turns out Netfixer also shares cookies with Safari. But on our long page, Netfixer crashed. On a smaller page, Netfixer worked with no problem. I was able to shoot a page up to 33464 pixels long quickly and easily. ShinyFrog don't even have a web page about the amazing Netfixer anymore. There's trunk code for someone who wants to develop Netfixer further. What is amazing about the ShinyFrog code is as it was done right in the first place, it still works reliably many years later. Here's a zipped up copy of the final binary, Netfixer beta .02. Going forward I'll be using Paparazzi who has risen like a Phoenix from the ashes. I will make Netfixer my next choice, thanks to its attractive and ultra-simple interface. I will try to avoid Layers as Layers a bit fussy and crashy on 10.6.8 at least. Layers often freezes up if you choose the wrong screenshot format, requiring a force quit from Force Quit Applications or Activity Monitor. In the end, workflow will be faster if one can take quick long webpage screenshots without have to open a separate application. If you are wondering what utility I used to make these screenshots: Yellow Mug's Snap-n-Drag as it lets me shoot just windows and has great quick save functionality. While I own the Yellow Mug bundle, the only application I still use regularly is Snap-n-Drag: Yellow Mug's image manipulation utilities use fairly crude algorithms which lead to some deterioration on artistic photography in so are of little use to me. For the shot of Layer's menubar interface in action, I resorted to Apple's built-in cmd-shift-3 for a full screen screenshot and then cut down the shot in Preview. 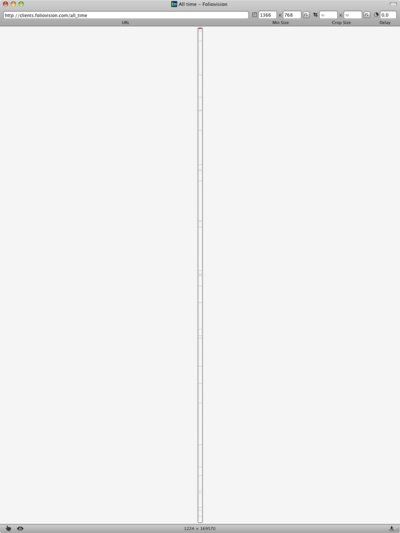 In both cases, I've set format to .png to avoid any jpeg pixellation.